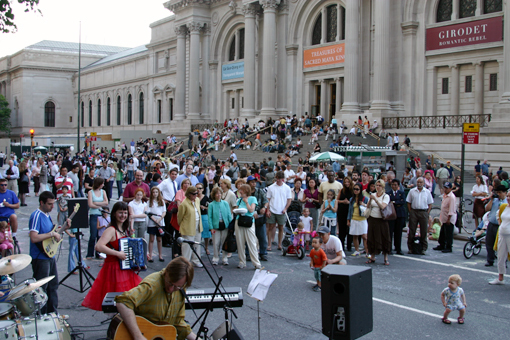 One day a year 9 of the country’s finest museums collectively open their doors for free to all New Yorkers and visitors for a mile-long block party and visual art celebration. Admission will be free at the Met Museum, the Jewish Museum, the Guggenheim, the Cooper-Hewitt, Museum of the City of New York, el Museo del Barrio, the Neue Galerie and the National Academy Museum. This traffic-free, music- and art-filled celebration fills the street and sidewalks of Fifth Avenue from 82nd to 105th street - over 50,000 visitors attend the festival annually! This year’s Museum Mile Festival will be held on Tuesday June 8th from 6:30-9:30pm. What better way to get to this car-free paradise than by riding your bike! Take advantage of free bicycle valet parking provided by Transportation Alternatives co-sponsored by Upper Green Side and BicyclesNYC. See ya there! Remember, the Met garage takes bike parking (you park, you lock; not valet) every day of the year. Very convenient.